"No matter what you do with this case," Carr said, "the mystery deepens. " Many unsolved crimes still intrigue the minds of investigators, victims, witnesses, as well as the general public. One of the most popular of these crimes is the one that involves a man by the name of D.B. Cooper. While the crime that this man committed was mysterious in implementation, it is not what draws interest to the case. It is the fact that the true identity of the presumed D.B. Cooper was never established. It was the fact that he was never located. It is the fact that the money that was taken by the man never resurfaced…it was the fact that it seems as if he dropped off the face of the earth just as quickly as he dropped out of his flight after committing the crimes. In this study on unsolved solves that are considered some of the greatest unsolved mysteries of the world; you will learn many facts pertaining to the infamous and mysterious D.B. Cooper. Flight 305 out of Washington DC began as any other uneventful ordinary flight, but it would end on a note that was nothing short of incredible. Stops were scheduled to take place in Minnesota, Montana, Portland Oregon and Spokane Washington. That stringent schedule too, would not pan out quite as planned. While the people of the flight took the time to say their goodbyes to loved ones and prepare for their flight, one man stood alone. He reviewed the plan that he had reviewed in his head so many times prior to arriving at the airport. He watched at the unsuspecting victims boarded the plane – not realizing that their lives would change forever and knowing that their fate rested in his hands. 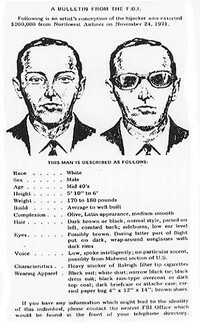 D.B Cooper was not only considered evil, he was considered one of the most notorious criminal masterminds of his time based on the events that were about to transpire. What took place on the Northwest Airlines flight--on that giant 727-- literally rivals anything that the best mystery or crime writer could have written in their heyday. In one of the most daring and amazing skyjackings ever recorded, a non-descript middle aged man who was billed simply asperformed something heretofore unknown. He foiled all attempts to capture him, and walked away with more than two hundred thousand dollars from Northwest Airlines, floating off into the clouds over the southern part of Washington State. Naturally, he planned out his criminal adventure in full detail – even with complete documentation that he would submit to the flight attendant upon entering the air vessel. D.B. Cooper boarded the flight dressed in a suit and tie, dark glasses covering his face and hiding part of his features. He handed a note to the flight attendant, Florence Schaffner, who assumed that he was attempting to make an assignation. She stuffed the note into her handbag when the passenger politely told her that she might want to take it out. The note was clear and concise. When they arrived in Seattle, D.B Cooper wanted two hundred thousand dollars and four parachutes. Naturally, this was quite frightening for the flight attendant and her mind scrambled on ways to appropriately handle this situation so that all of her passengers would safely reach their destination. The man then showed her his briefcase, which held cylinders that were wired together, and told her again very calmly that if the airline did not meet those demands that the plane would be blown up. The president of Northwest said - without any consideration - that his demands were to be met immediately. They circled in the skies over Seattle until the air pirate was happy with the arrangements and believed that his demands had been met and the plane touched down for him to collect his reward. The level of control that D.B Cooper held over that flight and the fact that so many lives were subjected to his criminal insanity have resulted in this story becoming one of the most popular among all unsolved crimes. Once the plane landed, the passengers did not debark but sat quietly. The silence that filled the airliner was often described as being literally deafening until he determined that it was time to permit some to leave the plane. The money and the parachutes were brought aboard the plane and the hijacker permitted the passengers - as well as some of the flight attendants - to leave the plane. One flight attendant was kept with D.B Cooper as his assurance that no one would attempt to stop him and he requested that he be flown to Mexico. He was told that it was impossible and that they would head to Reno to refuel and then fly on to Mexico, but Cooper had no intention of ever going to Mexico and knew precisely what he needed. In fact, he insisted on certain things during the flight. Cooper requested that the plane fly at under two hundred miles per hour and that it fly under ten thousand feet. He locked the hostage into a cabin and was not seen again. At some point, the hijacker jumped. Oddly, there were chase planes behind the Northwest flight and none saw him leave the flight; however, given that it was dark, had he chosen to free-fall, it would have been possible that he could jump unseen and open parachute lower to the ground. Many theories developed on how he could have exited the flight while remaining unnoticeable to crew members of the chase plans. This too, contributes to the fact that this is considered to truly be one of the most mysterious of all unsolved crimes to date. The FBI began a manhunt, all the while assuring people that he could not possibly have survived the fall. The area was thick timber, the hazards it presented were such that unless he were a very seasoned parachutist, it would be impossible to jump from a 727 into this kind of terrain and live… yet no parachute was every found. Despite the fact that the investigators searched diligently for a body, none was found in any of those four state areas… sky and ground searches turned up nothing. This was highly unusual. It was common for at least some evidence to show up, but amazingly, this criminal mastermind covered his tracks well enough that not even a shred of concrete evidence was present in any of the areas where he could have jumped. The FBI again reopened the case just a few years ago, seeking - at the least- an identity. Did D.B. Cooper survive? It seems likely that he did. While the thickly forested terrain could have hidden a great deal, the parachute would have been seen from the air or at the least found in the years that passed between then and now. D.B Cooper was never seen again. Investigators have continued to search for traces of a body that could be identified as the mastermind that succeeded in this unusual crime, but have recovered nothing more than a few traces of DNA that was located on a tie that was used during the investigation. Also, it has been suspected that a small amount of the money that was used for the ransom that he requested was located, but the confirmation of such evidence still remains ambiguous. Did D.B. Cooper die on his headlong jump from the plane or did the audacious hijacker get the second chance at life he seemed to be seeking –with two hundred thousand dollars to help him to start over? As one of the most popular unsolved crimes, this is still considered one of the greatest unsolved mysteries. On the 1st day of November in the year of 2007, the F.B.I developed a renewed interest in this mysterious crime. By the 31st day of December the same year, this organization blasted a detailed press release to the public with interesting facts and even an assortment of photographs in order to assist those that were involved in the case in recovering any type of information that they could remember. Unfortunately, this effort to pull in new leads proved unsuccessful and this is still considered to be one of the most popular unsolved crimes. D. B. Cooper aging process.